When I was in Kindergarten, one of the books my teacher read to the class was "Cloudy With A Chance of Meatballs," and I remember loving it at that young age. I thought it was cool, weird and magical all at the same time. When I was young, I dreamed of a film version of the story, and I could not believe in 2009 that I would get one. I liked the first film, especially because as I got older, I realized that it would be tough to adapt. Its a short story and alot of it is unexplained. I felt the changes made from book to film worked well and it was a wonderful example of a family film. I liked the sequel, but not as much as the first film. I like many things about the sequel, but overall it mostly treads water. Oh sure, its different about how it treads water, but trust me it does. I feel like that is the laziest way to create a sequel. I don't care what type of film it is, just redoing what you did the first time around and slapping a new-ish twist on it is lazy. No matter what though, the voice talent by Bill Hader, Anna Faris, Will Forte and Terry Crews (among others) is well utilized. The animation is lush and beautiful and used to near-perfect effect. 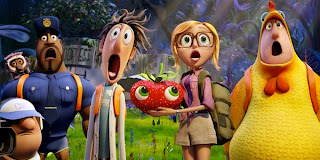 "Cloudy With A Chance of Meatballs 2" has everything needed for astounding sequel. But eventually all our favorite characters end back up on the island, because Flint's (Hader) machine from the first film is still operational and its making animal-food hybrids known as "foodimals." So the premise is a little disappointing, it never really gets to being more of the same (as in bad food weather) but animals intertwined with food go around attacking them, and good foodimals helping them is kind of familiar in a way. There is also a ridiculous subplot involving Chester V (Forte) a super-inventor who was Flint's inspiration. He tries to help clear the food off the island, but he has a sinister plot himself involving the foodimals. The plot is kind of predictable and boring. I suppose the filmmakers shoehorned it in to keep things provocative, but under all the cuteness and fluff, the message gets lost. But like I said, the voice work and animation is great. There are some big, funny moments, as well as moments the whole family will love. Just the familiar storyline kind of nagged at me. I feel if the studio was clever enough to change the book into a cool story in 2009, I thought they'd be clever enough to come up with a cooler, original sequel. Sadly, that is not the case. But its still a fun movie.